The following miscellaneous observations may be of interest. The first hummingbird I saw using my newly-installed feeder, on 3 September, was a Long-billed Starthroat. It has returned several times since, though Rufous-tailed now dominate. On one occasion the gorget showed clear lateral projections, befitting the name Starthroat better than the illustration in Angehr. On 12 October I saw a male Purple-throated Mountain-gem at Monte Azul, at about 1000m. Blue cap, purple gorget and white post-ocular stripe were all clear in direct sunlight. This extends the range stated by Angehr a little to the east. 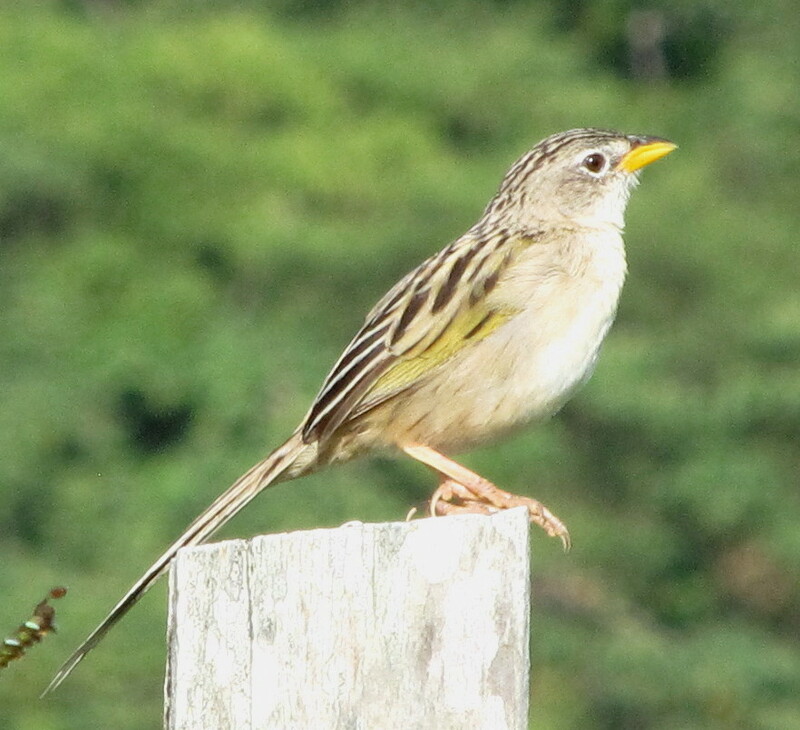 On 9 October, at Valle Bonito, five small birds foraging on or near the ground took to the trees on my approach, revealing yellow rumps and flanks. I could not get a definitive sighting but Yellow-rumped Warbler would appear to be only possible identification, in which case they were a full month earlier than the period stated by Angehr. Blackburnian Warbler have been more numerous than in previous years in my experience, many males showing orange throats. On 8 October I saw a Plumbeous Kite in soaring flight over Paseo del María, its rufous primaries clearly visible even through the low cloud. I often see a White Hawk perched or soaring over the east side of the María valley. On 2 October, on cattle-grazing land below the Mirador del Pacífico ridge, this Wedge-tailed Grass-Finch obligingly posed for a photograph.